← Strata the Gourmet Cheese and French Bread Casserole! This is not a new flavor combination in fact it has been around for a long time in France. 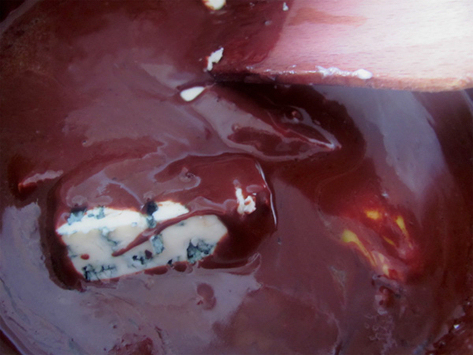 Dark Chocolate and Blue Cheese was made famous by Chef Michel Bras in a dessert called Coulant. 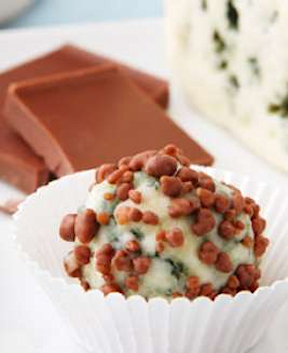 We are going to make Roquefort Bites which are Roquefort cheese rolled into balls and then rolled in chocolate pieces. But first some history. A long time ago, every story starts out this way and because this is a French cheese you know it has to include a little romance. So we begin, at the base of the Combalou Mountain, a shepherd spotted a beautiful young woman. He ran after her, leaving behind his flock and his meal, which included ewe’s milk curds, in a cave with some bread. The young woman didn’t want to be caught and so she ran and hid from the shepherd having him chase her for days. He looked and looked for her but could not find her. He slowly made his way back to his flock. He found his meal which was now less than appealing with green veins running through the curd. But the shepherd was starving from days of searching for the love of his life so he tasted the cheese…..and fell in love with the magic of the cheese and now you know the legend of Roquefort. He forgot the beautiful young woman and started making Cheese. What I am a Cheese Monger you didn’t really expect him to get the girl did you? The unique look of blue cheese is a result of a specific type of mold added during the cheese making process and an additional step in the ageing process called “needling”. The molds added to blue cheese are derived from the genus Penicillium. The most widely used molds in blue-veined cheeses are Penicillium Roqueforti and Penicillium Glaucum. These fungi are found commonly in nature and were “discovered” by cheesemakers ageing their cheeses in damp, cool caves. Penicillium Roqueforti is named after a French town called Roquefort with caves full of naturally occurring Penicillium mold spores. It is cheesemakers in the town of Roquefort who created, and still creates, the famous blue cheese called, of course, Roquefort. Original recipes for Roquefort cheese required that cheesemakers leave loaves of rye bread in the caves near the town. The loaves became hosts to the ambient mold in the air. After a month or so, the mold inside the loaves of bread was dried, ground and combined with cheese curd. (Remember, the bread simply acted as a host for the ambient mold spores in the cave; Penicillium Roqueforti is not the same type of mold that grows on any old loaf of bread one might leave out.) To further encourage the growth of mold that flavored the cheese, the wheels of cheese were aged inside the caves. Today, most cheesemakers use commercially manufactured Penicillium Roqueforti cultures that are freeze-dried. After the mold cultures are introduced to blue cheese, the “needling” begins. Wheels of cheese are pierced (either by hand or by a device that can poke many tiny holes at once) to create tiny openings. Air enters the wheel of cheese, feeding the mold, and blue/green veins form. The flavor of Blue cheese is often an acquired taste. Some people initially find the pungent, almost peppery, flavor of varieties such as Roquefort, Stilton, Gorgonzola, Danish Blue and similar cheeses to be overly strong. However, when one becomes used to the flavor, it is quite delicious. The flavor of Blue cheese is dominated by a class of compounds known as n-methyl ketones (alkan-2-ones). Spores of the blue mold, Penicillium roqueforti, germinate within mechanical openings (needling) in the cheese mass to form the blue veins characteristic of these varieties’. roqueforti produces two potent extracellular lipases which dominate lipolysis in these cheeses which have the highest levels of free fatty acids of all cheese families. However, liberation of fatty acids from triacylglycerols is only the start of the process of producing the Blue cheese flavor. P. roqueforti converts fatty acids to n-methyl ketones by a four-step pathway corresponding to the early stages of beta-oxidation. Heptan-2-one and nonan-2-one are the predominant n-methyl ketones in Blue cheese and contribute greatly to its pungent flavor. So now that you are full of knowledge here are a few pictures to get you back to that nice romantic place you were in when I told you the legend first. We know that if you are brave and try this combination with a good red wine you will understand why the shepherd gave up on the beautiful woman.